Sneak peek at a Voluntaryist 3D printed figure prototype. 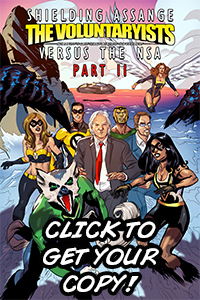 THE VOLUNTARYISTS VERSUS THE TSA – COMIC CAMPAIGN NOW LIVE! When the blue-gloved TSA menace reaches under the people’s skin, the Voluntaryists opt to resist! 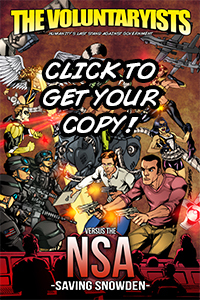 Check out Voluntaryists Versus the TSA and share the word on your social media pages! Feel free to check out the perks and, if feeling generous, get involved with a perk support option! 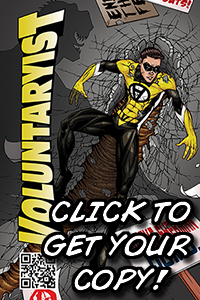 THANK YOU FOR MAKING VOLUNTARYIST- THE COMIC SERIES A WILD SUCCESS! Anarchast Ep. 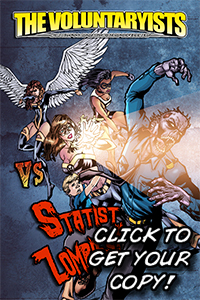 178: Voluntaryists Versus Statist Zombies! Check out our latest video interview with Jeff Berwick on Anarchast! 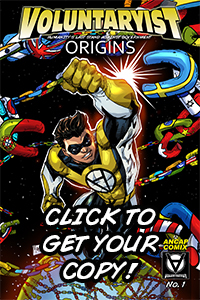 Voluntaryist Origins III – Comic Campaign Now Live! THE ORIGINS II COMICS HAVE SHIPPED! Origins II Comics Have Arrived! First wave of shipment.